Kale is a fantastic leafy green. It’s rich in bone-supporting minerals and loaded with antioxidants. But it can be a little “tough” to prepare, so today I’m sharing with you the best way to prepare raw kale! There are many ways to prepare kale, whether you like it steamed, sautéed, in a stew, or thrown into a smoothie. One of my favourite ways to eat kale is mixed in with a salad. Here are some of the amazing benefits of kale and my favourite way to prepare it! Sulforophane, a phytonutrient found in cruciferous veggies, helps boost detoxification enzymes which can in turn help remove carcinogenic substances more effectively. Kale is an extremely rich source of beta carotene and carotenoids lutein and zeaxanthin. These filter UV light and help prevent eye damage. Kale is a great source of vitamin C which helps boost the immune system, neutralize free radicals, and support cellular health and other bodily components from oxidative damage! Hooray! Kale contains goitrogens. Is this safe? Goitrogens are substances that can inhibit the bodies uptake of iodine, an important mineral for thyroid function. Raw kale is goitrogenic and is thought to be detrimental to those with thyroid problems, however, there is no evidence as of yet that suggests consumption of goitrogen-containing foods negatively impact health in an otherwise healthy individual and can actually still be beneficial for those who do have thyroid imbalances. … no human study has demonstrated a deficiency in thyroid function from consuming cruciferous vegetables … The only case report relating cruciferous vegetables to thyroid harm suggests that it would be almost impossible to consume enough cruciferous to harm the thyroid. You know your body best and what does or doesn’t feel right. My opinion? Healthy moderation, like anything! Goitrogen-containing foods eaten within reason are nutrient dense and are very beneficial to our health, but if you’re still concerned, cook ’em! Cooking these vegetables helps deactivate most of the goitrogens. Kale and other cruciferous vegetables are not the only source of goitrogens – some lesser known sources include strawberries, sweet potatoes and peaches, and I’m sure not about to give those up! Let’s get on to the good stuff. The easiest way to remove kale leaves off of the stem is to simply pull them off! You can do this by grasping the bottom of the fibrous rib and firmly sliding the leaves off. 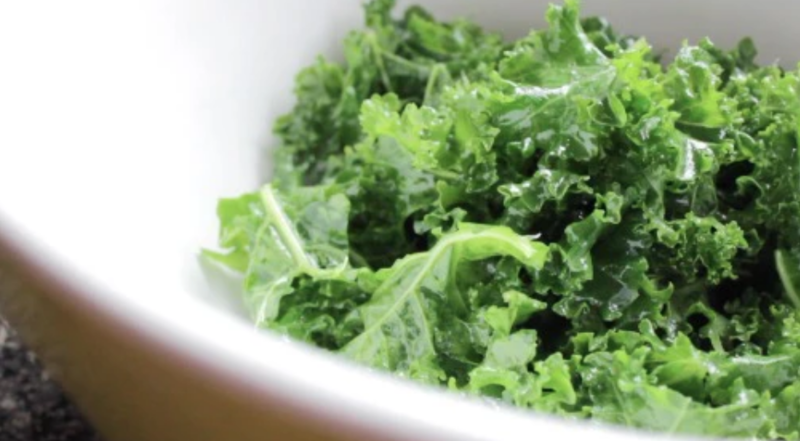 After you have rinsed your kale leaves, add them to a bowl. Drizzle 1-2 tbsp of your choice of oil on top (olive oil, avocado oil or grapeseed oil are great options) and simply begin massaging the leaves together between your hands for about a minute. Massaging raw kale with oil helps to soften the toughness of the leaves, making it easier to chew, and it also helps make it more palatable as kale can be a little bitter. Once finished, the kale will appear limp and vibrant green. Your kale is ready to go! Add it to your favourite salad and enjoy. What’s your favourite way to eat kale? Salads? In smoothies?